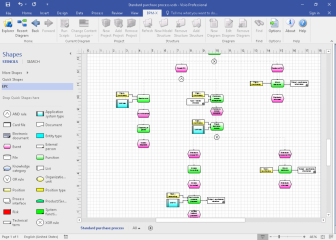 Besides all new functionality the easiness-of-use is the striking argument to chose Visio for the design of visual documentations such as business process flows or enterprise architecture diagrams. With the BPM-X rules engine as an add-on under the wraps of standard Visio, the diagramming tool is enhanced for professional enterprise modeling. All data is securely stored in a single enterprise inventory using a repository application server´s web services. It is the combination of industry standard Office products with scalable server based data storage that constitutes the benefit of this architecture. Diagrams and objects may be loaded from the central repository server into temporary extracts, e.g. to be used off-line by contributors or travelers for independent work like workshops without mandatory connection to their intranet. Changes made can be updated in the central repository once contributors are back to office or connected to an enterprise network. The benefit of a central repository is web based analytic reporting and publishing of all data, mashing-up model data with process performance data. Key performance indicators from data warehouses are merged into the business process view and published to a process performance dashboard including a variety of business diagram charts. In the upcoming blogs we will describe solutions built for operational performance management in more detail.